Dating - Get two months free! An estimated 10,000 people gathered to watch giant television screens in New York's Central Park and cheered on as astronaut Neil Armstrong took man's first step on the moon on July 20, 1969. How well do you know the trivia behind America's moon program? 360-degree surround views of lunar landings, spacecraft, mission control and more. Sunni fighters find benefits in alliance with U.S.
Do you Believe? Is it Britney or body double? CAPE CANAVERAL, FL - The world watched with breathless anticipation as two astronauts swooped toward the lunar landscape in their landing craft — the first of their kind to descend on the moon. The astronauts held their breath, too, as they stared through their helmet visors in wonder, the lifeless face of the moon rushing toward them. The landing ship was named Eagle, and within its boxy and cramped cabin Neil Armstrong and Buzz Aldrin stood with legs spread, booted feet flat against the deck. Each was sealed within the protective layers of a pressurized spacesuit, and each instinctively tugged at the cinches on his body harness, secure in his tight confines. Eagle rushed on in the grip of the gravitational pull of the moon below. Armstrong and Aldrin knew they were moving by what their instruments told them and by the gliding motion of craters past their triangular windows. A quarter-million miles away, in Houston, a fellow astronaut named Charlie Duke studied glowing instrument panels, listened to the chatter of his moon-bound colleagues and that of those in the Mission Control Center around him. Everything he observed and heard fed him critical data about Eagle's plunge toward the lunar surface. "Eagle, Houston," Duke said into his microphone. His words, crackling and charged with static, raced at the speed of light, 186,300 miles per second, to the two astronauts falling toward craters and dusty rocks. "If you read, you're GO for powered descent." Armstrong and Aldrin were not alone. A third member of the Apollo 11 crew, Michael Collins, was 50 miles above them, in lunar orbit in their command ship, Columbia. He had clearly heard the vital message from Earth. Astronaut Edwin E. Aldrin Jr. walking on the surface of the moon on 20 July, 1969. "Eagle, this is Columbia." His words flashed instantly into the headsets of Armstrong and Aldrin. "They just gave you a GO for powered descent." The two men glanced at each other. "Roger," Armstrong acknowledged. They were now headed for a waterless sea known as Tranquility. This was it. PDI. Powered Descent Initiate. On Earth, radio listeners and television viewers gripped their seats. Some prayed. Fingernails dug into palms. Nine miles above the lunar surface, flames gushed beneath Armstrong and Aldrin's feet. Glowing, gleaming plasma in a shock wave buoying them in vacuum. The Eagle rocked from side to side and pitched violently. The computer — sensitive, alert, instantly responsive — fired control rocket thrusters to hold the craft steady. Deep within the bowels of Eagle were computers essential to measuring all the electronic and mechanical forces and factors that would determine the success of the lunar landing. Headsets crackled. Duke in Mission Control was incredibly calm and professional as he called out: "Eagle, Houston. You are GO. Take it all at four minutes. You are GO to continue powered descent." Suddenly Eagle's computers shrilled madly. Alarm! Emergency signals flashed within Eagle and one and a half seconds later on the consoles in Mission Control. No one expected a cry of danger. Not now. At 6,000 feet above the moon a yellow light flashed at the two moon landers. Buzz's voice responded immediately as he called out numbers flashing on his flight panel and on the console before Steve Bales in the control center. "Program alarm," Buzz snapped crisply. "It's a twelve-oh-two." Twelve-oh-two. A warning that the ship's main computer was overloaded. So much was happening, so many performance signals were being generated that the computer could not absorb them all. It was a cry for help. There was no panic. Everyone sensed an abort. A hellish maneuver that would explosively separate the upper ascent stage of the Eagle from the landing stage and squeeze every ounce of thrust from the ascent rocket to make it climb back to a rendezvous and docking with the command ship Columbia. All eyes were on Bales. He stared at his console. Coded numbers told him instantly what was going wrong. The computer within Eagle was being overtaxed with data. The alarm was the result of executive overload. Armstrong's voice was strong. "Give us the reading on that twelve-oh-two program alarm," he demanded. July 20: Jay Barbree talks with MSNBC-TV’s Sam Shane about the historic event. "GUIDO?" Flight Director Gene Kranz shouted. Everyone hung on the edge of their seats. Kranz didn't have time. Armstrong and Aldrin didn't have a single second to spare as they plunged toward the moon. Kranz stared at Bales. The flight director slammed a fist against his console. Bales jerked in his seat. No time. No damn time. "GO!" he shouted. He closed his mike, staring at his console. "Go, damn it," he said in a hoarse whisper only to himself. Duke showed surprise. He didn't have time to wait, either. His words came forth immediately. "We've got, uh, we're GO on that alarm, Eagle." Thirteen hundred feet above the moon's surface, Eagle began its final descent. Flames gushed downward as the craft slowed, and Armstrong gripped the hand controller in his fist, firm and strong, with a touch honed by years of flight in jets and rockets. Armstrong needed to hand-fly the rest of the way. Eagle was sailing down at 20 feet per second. Neil nudged the power, slowing to nine feet per second. He needed to feel his ship. Far away, down through the atmosphere and clouds of earth, enclosed within Mission Control, flight controllers were almost frantic with their inability to do anything more to aid Armstrong and Aldrin. Duke keyed his mike. A timer stared at him. "Thirty seconds," he said. 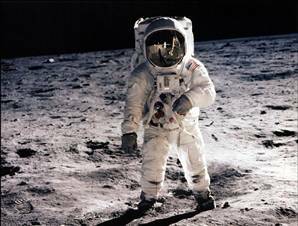 More than a billion people on the surface of Earth listened and stared at radios and televisions, hoping and praying as Armstrong flew Eagle with the smooth touch of experience. Then, these words from Aldrin on the moon. "Contact light!" "Okay, engine stop ... descent engine command override off ..."
In Houston, Duke was choking with relief. "We copy you down, Eagle," he transmitted. Then waited. Three seconds for the voices to rush back and forth, earth to the moon and moon back to earth. Armstrong's voice was calm, confident and clear. "Houston, Tranquility Base here. The Eagle has landed." The desolated moon rolled in from all sides. No birds, no wind, no clouds, no blue sky. Only rocks and shadows and craters and dust. Duke had opened his microphone, and the wild and tumultuous celebration inside Mission Control poured and vibrated and rumbled across a quarter-million miles and brought smiles to the faces of the only two living creatures on the lunar landscape. Today, 35 years later, that celebration is still heard, as many historians are in agreement: Apollo 11's landing on the moon was one of the greatest technological achievements of the 20th century. Jay Barbree is an NBC News correspondent and the only reporter who has covered all 144 missions flown by American astronauts. Barbree and the NBC News Space Unit received an Emmy Award for coverage of the Apollo 11 landing in 1969. U.S. ties to boost Sunni fighters?